As real life superheroes, mothers like us have a number of villains to defeat. One of them is the non-stop cough that keeps our children up at night causing them to miss school and hinders them from achieving their daily goals. Days with these annoying cough just turns sourly as you see your child in such horrendous state. Luckily, I stumbled upon a product which is worthy of my lifelong trust. Just like Batman has Robin, Mermaid man has Barnacle Boy and Superman has Jimmy Olsen, Pambatang Solmux 200mg surfaced to my life and is here to stay to help me fight off viruses and bacteria which cause cough with phlegm. Pambatang Solmux 200mg is truly a blessing for mothers like me who has such stubborn sons when it comes to drinking cough syrup. 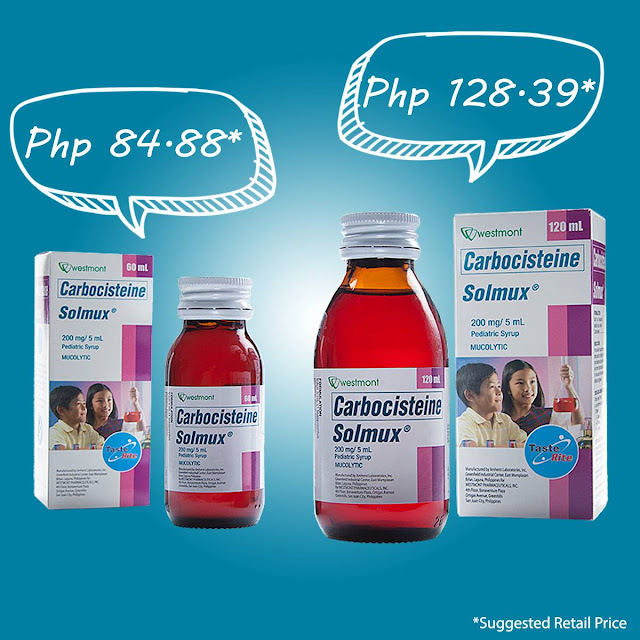 It takes less effort to make them drink the needed amount of remedy because it contains 200mg of medicine per 5mL unlike other carbocisteine medicines with only 100mg medicine per 5mL. With Pambatang Solmux 200mg by my side there is no doubt that we make the best tandem. It comes in two different bottle sizes. You can purchase the 120mL bottle which you can stock at home or the 60mL bottle which you can bring with you on the go. Pambatang Solmux 200mg is recommended for ages 2-12 years old. It has an efficient viral and bacterial expel power that a cough medicine can ever have. So for the best mommies out there, I can only suggest the best to match your awesomeness. Use Pambatang Solmux 200mg, it makes the best tandem with the best mommies out there.